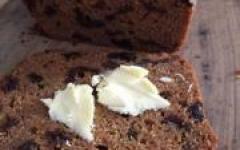 A few days ago, Carly Talbot of gutenfreeb.com asked if anyone had a recipe for a gluten free version of a malt loaf. A malt loaf uses barley malt and barley flour, both of which are not gluten free. To get the required squidgy, stogdgy texture and the malty flavour some improvising would be required. I was keen to have a go. If you are into malt loaf, then you will probably recognise the brand Soreen. This is a quintessential English/British brand, makers of the original malt loaf. Although I have seen it on the shelves with it's distinctive packaging, I admit, I have never actaully tried it. Apparently you slice off a thick wedge and slather it with butter and wash it down with a strong cup of tea. A very British experience and a bit of an acquired taste. Well I tried it and I like the deep treacly flavour and the saltiness that comes from the malt. The texture is a bit rubbery and reminds me of a bread that's gone badly wrong. So whilst not a traditional copy of the original, my version has the deep caramely overtones and an earthiness similar to the original, but the texture is more like a moist tea bread. Here is a recipe from my first book The Little Red Barn Baking Book. This recipe was one which has very happy memories, eating cookies at my best friend's house after school, whilst doing our homework. Mrs. J, was my friend's mum. I've been wanting to make a gluten free version for a while, and I am pleased to tell you, they are as yummy as i remember them. Crispy on the outside and soft and chewy on the outside, with just the right amount of spice. The picture was styled by Ruthie, and features Ratty, Panda, Rabbity and if you look very closely a small cat, whose name escapes me. They are settling down for some cookies and milk. And yes, these cookies are pure bliss dunked in milk. Those cuddlies sure do know how to live. Enjoy! Everyone I know is currently on The Dukan Diet As part of my plan to sabbotage this love affair with Pierre Dukan, I made a batch of buttercrunch toffee, placed it in a nice box and took it to a ladies lunch yesterday to test their will power. They all crumbled. Even the ones I had down as Dukan Diet die hards. The box and the contents were demolished within minutes and every last little crispy fragment was scooped out. Lesson learned, the nice box was totally redundant. Just a paper bag would have done the trick. Anyway, diet or not, I urge you to make this little gem. Your waistline may not thank you but it is a very good way to cheer yourself up when the weather is lousy and lousy it is my friends. For a summer that has drought written all over it, you could have fooled me. It's pouring here. A piece or two or three of toffee, a cup of coffee, hey, who cares what the weather is like. The recipe comes from The Perfect Scoop by David Lebovitz with a few minor adaptations made by yours truly. It's all things pumpkin 'round here at the moment. These yummy muffins are savoury and just the right antidote to all those sugary treats that kids will be feasting on in a few days time. Savoury muffins are all the rage in the US and I gather in Australia too. This particular recipe adapted from www.101cookbooks.com caught my eye. You may have to sell these in....as kids will be suspicious of anything looking like a muffin, but tasting decidely different from what they may be expecting. Tasty and nutritious I think these would be good in lunchboxes and as an after school treat. These are delicious and can be made in advance and frozen. Serve with oven chips and a fresh green salad. Thank you to Moss for sharing his secret recipe. 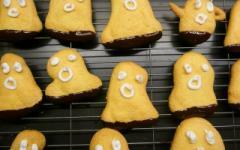 Here's a quick little recipe for making ghostly biscuits. The recipe is in my book (page 179) but I am reprinting it here. What I like about this recipe is that the biscuits are very easy to make and there is no rolling out and cutting. You can pipe them into ghostly shapes and then let the children decorate them. A fun and not too messy activity during half term. Here's a fun recipe for Halloween. I tried this on some of Ruthie's friends last week and they loved it. It is really easy to make and if there are any left over maybe you can sneek a couple when the kids go to bed. And there is nothing to stop you making this for adults. 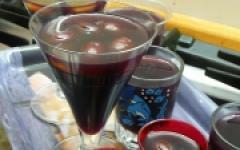 You can substitute alchoholic sparkling grape juice to make a more adult centric dessert. You are going to love these. The texture is light and springy and they can stand shoulder to shoulder with their gluten equivalents with their little bun faces held up high. The most requested gluten free recipe is without a doubt Yorkshire Puddings. Here's a simple recipe which yields great results time after time. A great gingerbread cookie for your gluten free repertoire. 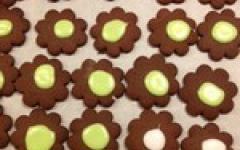 It holds up well to decorating and unusually for gluten free cookies, it's a good keeper. If you have time, rest the dough for a day or two to mature the flavour. This is the holy grail of icing. It's really simple and uses all of 4 ingredients. The key is using good quality unsalted butter. You don't need anything fancy, but don't go for the bottom end of the market. I use Lurpak unsalted when possible, but most of the supermarket butters are fine too. The one to definately avoid is Anchor butter It just doesn't cut the mustard. For those of you avoiding dairy you can try using one of the dairy substitutes like Pure Sunflower, but to be honest you won't get that lovely buttery taste. Here is a work horse recipe from my book The Gluten Free Cookbook for Kids. It's my all time go to recipe whenever a cupcake is required. I've made a few changes since the book was published which I am happy to share with you. For children's parties I like to make the tiny little bite size cupcakes as I find kids are more interested in the icing then the cake. If these are for adults, then make the standard size. These are a little like cheese scones, only much lighter and tastier. 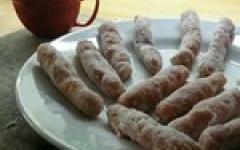 They are one of the top recipes in my book The Gluten Free Cookbook for Kids. This recipe is really easy and one which children enjoy getting involved in. The cheesy snakes make great breakfast food and are also perfect as an after school snack. They are at their best straight out of the oven, but you can also freeze them. I usually wrap a few of these in foil and keep them stashed away in the freezer. You can pop them straight into a hot oven, conveniently wrapped in their little foil overcoats and they will be ready to eat in about 15 minutes. 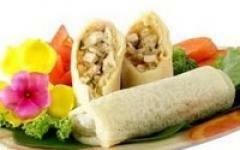 Lumpia is a type of spring roll, served as a snack in Indonesia. Unlike spring rolls, this version of lumpia is not fried. The ones made by Muthiah are a bit like eating a very soft, velvety, crepe surrounding an intense savoury filling. Lucia, who has never been to Indonesia, pronounced them the best lumpia ever. I've not been to Indonesia either, but I can say, I love lumpia! This recipe comes from our good friend Muthiah who very kindly has adpated the recipe to be gluten free. This is an Indonesian dish, which is a meal in itself, containing noodles, meat (either beef or chicken), prawns, vegetables and egg. As most good cooks, Muthiah's approach to cooking is to adjust the recipe as she is making it, knowing when to add a little bit more or a little bit less. I've tried to write down as clearly as I can amounts required, but I think it will be as Indonesian tradition dictates, for the individual to add their own little touches. This makes a great supper dish, or as part of a buffet. In our household we have it for breakfast and although it takes a little bit of time to prepare, it is well worth waiting for. 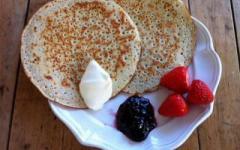 Our favourite breakfast pancake - serve with sweet or savoury toppings. Make them big or small, or make them in funny shapes for the hard to please. There is Pavlova and then there is Rose Scented Pavlova! For some Coeliacs the thought of meringue and cream describes a dreary pudding lacking both inspiration and imagination. Be prepared to be amazed. Not only is this a spectacularly beautiful dessert, worthy of being a birthday, christening or celebration centre piece, it is also gorgeous to eat. The crystalised rose petals and the scented rose cream make this truly special.